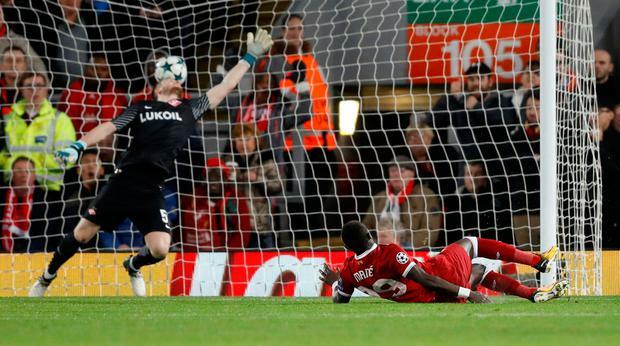 Damien Duff has branded Liverpool as possible Champions League winners after they sealed top spot in Group E with a 7-0 destruction of Spartak Moscow at Anfield. Jurgen Klopp's side were 3-0 ahead inside 18 minutes after a devastating opening salvo, and didn't let up after the break as they made a statement of intent ahead of Monday's last 16 draw. Speaking on RTÉ after the game, Duff, Liam Brady and Eamon Dunphy all heaped praise on Liverpool after their impressive victory. "Gutless and clueless," Dunphy said of the visitors. "It is hard to believe a professional team would die without putting up any fight. That is not taking a lot away from Liverpool because the goals were great. It was an outstanding night for Liverpool. "This underlines Liverpool's strengths and their weakness wasn't tested, their defence. They've got forward players that are better than Manchester United, than Arsenal. "They've got people with pace, they all score goals. Nobody else in the Premier League has that attacking talent." Duff went one step further, stating that although he thinks their defensive frailties rules out a league challenge, the European Cup is a possibility for Liverpool. "Their defence was never really tested but I still think they are potential winners of this tournament," Duff said. "They get found out over a league season over 38 games, but now they are in the knockout stages. Over two legs, they can beat anyone. We've seen what they can do in 20 minutes. They just steamroll teams with their energy, with the fab four as we call them. "Over two legs, Real Madrid, Barca, I think they could do anyone. I honestly do." Brady concurred with the former Ireland winger, but Dunphy disagreed with Duff's bold proclamation. "I don't like to take on these two titans but I don't want to delude Liverpool fans, some of whom are close to me," he said. "Liverpool won't win the Champions League because they don't have a defence."